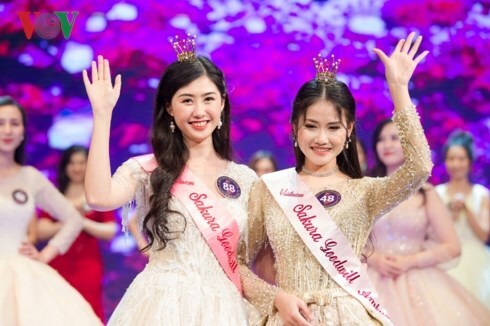 Hanoi (VNA) - Tran Dieu Anh, a student from the Vietnam-Japan University has been selected as the first goodwill ambassador for Japanese cherry blossom in 2019 after a competition held in the framework of the Japan cherry blossom festival - Hanoi 2019. Pham Ngoc Linh, a flight attendant of the national flag carrier Vietnam Airlines is the second goodwill ambassador. According to Director of the Hanoi Department of Culture and Sports and head of the organisation board of the event To Van Dong, the competition aims to encourage young people to learn about the culture and people of Japan, thus promoting cultural exchange between the two countries. The Vietnamese goodwill ambassadors for cherry blossom must have a passion for enhancing Vietnam-Japan ties as well as knowledge of and interest in Japan and N4-level Japanese speaking ability. The ambassadors will be responsible for fostering the Vietnam-Japan friendship by joining events related to Japan and Vietnam held in the two countries. They will begin at the opening ceremony of the Japan cherry blossom festival –Hanoi 2019. The Japan cherry blossom festival 2019 takes place in Hanoi from March 29-31. It features many cultural exchanges, including a display of Japanese cherry blossoms and Vietnamese flowers. Japanese tea culture, chess, Yosakoi – a unique style of dance staged by large teams - and folk games, along with Vietnamese arts like ca tru (ceremonial singing) and hat xam (blind wanderers’ music) will also be introduced during the festival. Visitors to the festival will have a chance to taste Japanese and Vietnamese dishes to be showcased at about 20 pavilions at the Hanoi Children’s Palace. There will also be investment and tourism promotion conferences, and an exchange programme on education and healthcare.